Why Do My Pipes Bang When I Close the Faucet Quickly? Home / Lakewood Ranch Plumber / Why Do My Pipes Bang When I Close the Faucet Quickly? Why do my pipes bang when I turn off my faucet quickly, is a question plumbers get asked a lot. Sometimes water pipes can make strange noises, creaking, whistling, just plain noisy or the most annoying, banging. You ask yourself, why? This is the first time your pipes have ever banged and it doesn’t sound healthy for your plumbing system. Your right. Banging pipes can be detrimental to your plumbing system and needs to be addressed. The Florida Plumbing Code Statue # 604.9 addresses water hammer. That is what pipe banging is called, water hammer. The code states the following: the flow velocity of the water distribution system shall be controlled to reduce the possibility of water hammer. A water-hammer arrestor shall be installed where quick-closing valves are utilized. Water-hammer arrestors shall be installed in accordance with the manufacturer’s specifications. Water-hammer arrestors shall conform to ANSI 1010. Water-hammer arrestors are mechanical devices that never need recharging. A plumber in Sarasota can also install air chambers in the walls behind each sink in the bathroom (plumbers call these sinks lavatories). To work properly these air chambers must be at the highest point in the system. The exception to this is if your water distribution system is PEX piping, this system doesn’t need air chambers. An air chamber acts as a shock absorber for your water pipes. Faucets available today, are quick closing. When you turn a faucet off quickly, the flow of water is energy. When the water is shut off abruptly, it creates a shock wave of energy. The air chambers absorbs this energy, so the pipes don’t bang. Air chambers over time get water-logged. As your plumbing system is used, the air in the air chamber gets displaced with water. When the air chamber is full of water with no more air, the shock wave of energy produced by quick closing valves has no place to go. Thus, the pipes will bang. How do you fix it? The remedy is actually quite simple. You recharge the air chambers. Here’s how. First, turn off the water coming into your house. go around the outside and open all your hose bibs( Faucets your hoses are connected to). Then, go inside and open all your faucets, hot and cold sides. If your faucets are single handles turn them to mix hot and cold. Flush your toilets. To ensure you break any air lock that may occur in the air chambers, blow air through the lavatory faucets through the spout. You will probably hear the faucets sucking air. This noise will confirm that you have recharged your air chambers. Turn off all the inside faucets, then turn off the outside faucets. Now turn your water back on to the house and turn on all your faucets and let them flow until the flow is normal. The banging went away. You fixed it! 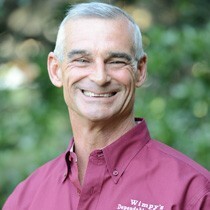 Don’t tell your spouse that you read this blog written by Bubba Butler of Wimpy’s Dependable Plumbing. Let them think that you are their hero! If your pipes are banging or whistling in Sarasota or Bradenton Florida, Wimpy’s Dependable Plumbing can solve this problem for you or talk you through it. We want you to Love Your Plumber! Call 941-322-1911.